What is the Largest Jellyfish on Earth? 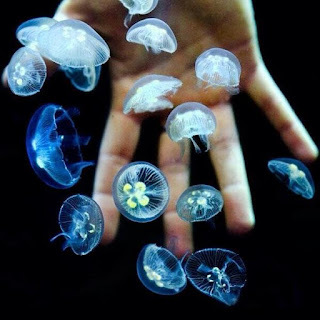 Jellyfish has hundreds of species with different shapes and colors. There sizes vary from very small to huge. 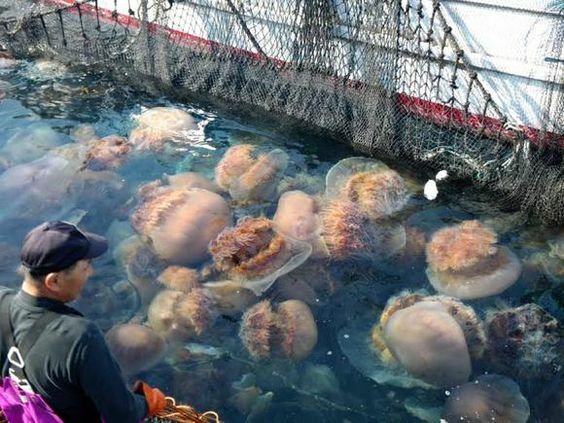 Some of these bigger species of Jellyfish can really be amazingly big. The two well known largest jellyfish species are Lion’s Mane jellyfish, and Nomura's jellyfish. There is another extremely rare deep sea giant jellyfish named “Stygiomedusa gigantean”. The size of a jelly can be measured from two sides. One way is to measure the diameter of its bell and another is the tentacles length. The jellies with large bells also have huge body mass. Note: Bell is the main body part of a jellyfish. It is the box like thing from which the tentacles hang. The tentacles are long thread like organs which are clustered below the bell of the animal. 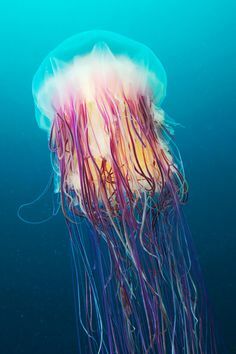 The Lion’s Mane is a very old species of jellyfish (they are prominent among the oldest surviving animals on earth today). They live in cold waters. Arctic and semi-arctic regions are full with these giants. There common habitations are the Arctic, North Pacific and North Atlantic Ocean. 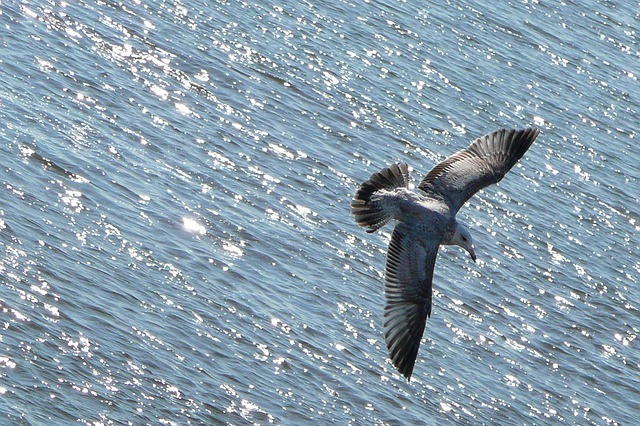 They can also be seen in the English Channel. Despite of their big size, these jellies are not very strong and easily drifted by the ocean currents. The average bell diameter of a mature Lion’s Mane is 50 cm (20 in). The largest specimens can be as big as 6 ft. The animal has very long tentacles. The big animal’s tentacles can be as long as 100 ft (30m) or more. 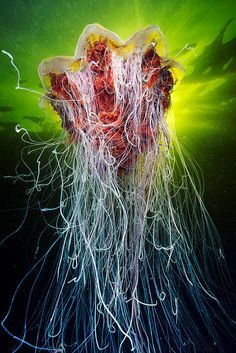 It is also the jellyfish with longest tentacles. These tentacles are extremely sticky. A mature jellyfish can have about 100 such tentacles clustered in 8 groups. 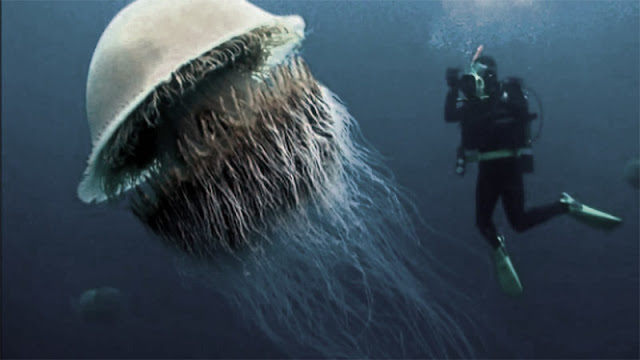 The largest known species of this giant arctic jellyfish was found in 1870 in Massachusetts Bay. That giant had a bell diameter of 6.7 m (37 ft) and its tentacles were 37.0 m (121.4 ft) long. 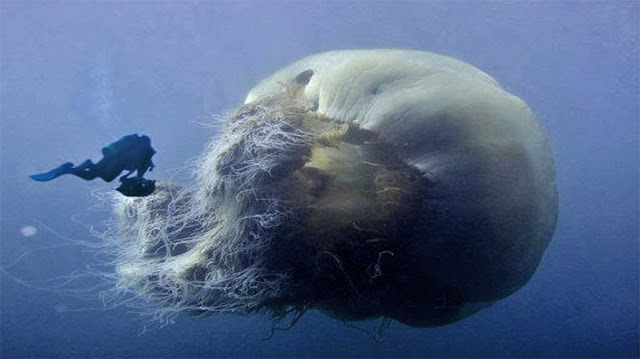 It is the largest jellyfish ever found and recorded by credible people. If we measure by length, we can safely say that at 120 ft, the Lion's Mane is the world's longest living animal (that not necessarily means the largest, though). It is even longer than a Blue Whale. The Lion’s Mane is venomous. Their stings are very painful. So, do not try to touch one. The venom is not fatal but medical attention is required in case of a severe attack. Nomura's jellyfish is another colossal jellyfish. That oversized plankton can be bigger than a man. It can have a bell with 6 ft 6 inches (2 m) diameter. The full grown animal can weigh up to 200 kg or 440 lb. To watch a Nomura in action you will have o visit China or Japan. The East China Sea and the Yellow Sea are full with them. Actually, there population is growing due to climate change and global warming. Do you know that the Nomura’s jellyfish is edible? Yes, some people in Japan eat that animal. Even there is an ice-cream using the flesh of a Nomura. Stygiomedusa gigantean is a rare species of big jellyfish which lives in deep seas. S. gigantean lives in the deep parts of the Antarctic or Southern Ocean. It was observed rarely by some lucky individuals. They can also be as big as Lion’s Man. 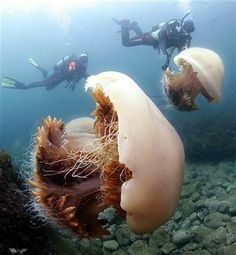 They can be considered among the largest jellyfish found on earth. See the video to see some of them in action. While these three above mentioned jellyfishes can contest for the top place, we can have another candidate for the next place after the largest three. The name of the species is Cyanea nozaki. Its popular name is “Ghost Jellyfish”. C. nozaki has a flat top bell which can grow up to 50 cm or 20 inches in diameter. The bell color is yellow or cream with a dark center. The edge of the bell is semi-transparent. The tentacles of the life form grow up to 10 m (33 ft). The ghost jelly also tend to form blooms like other big jellyfish species. Here is a video of one such jellyfish swimming happily under the ocean. Learn about artificial jellyfish tanks from our article. To learn more about the fascinating world under our oceans and seas, to help generating consciousness among people to save out oceans, you can follow our official Twitter or Facebook page.